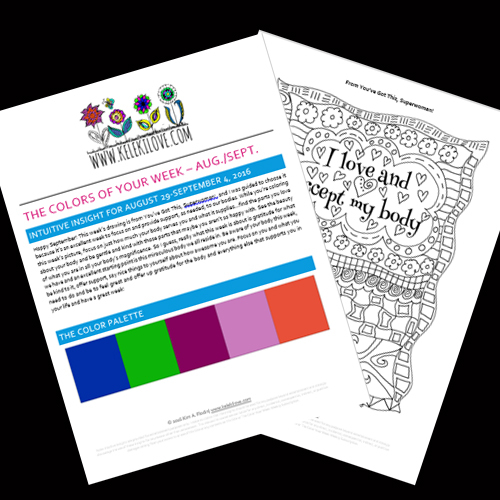 50% OFF The Colors of Your Week Coloring TODAY ONLY! ​​Colors of the Week Makes a Great Gift! Choose from 3-, 6- and 12-month subscriptions to give as a GIFT! Make sure you include the Gift Recipient Email Address and REMEMBER, you get ONE MONTH FREE, so gifts will actually last 4-, 7- or 13-months and you will be billed just $5 a month! ​WATCH FOR SIGN-UP LINK IN YOUR CONFIRMATION EMAIL! Just $2.50 a Month RIGHT NOW WHEN YOU BUY 3-, 6- or 12-Month Options! ​I look forward to hearing how this works for you! WATCH FOR SIGN-UP LINK IN YOUR CONFIRMATION EMAIL! TRY A SAMPLE WEEK HERE. This is a weekly subscription service. You will receive a ONE MONTH FREE TRIAL (four palettes, four coloring sheets, four intuitive insights FREE ), after which your card will be charged with your first payment amount dependent on which Subscription Package you have chosen. Your card will continue to be charged after your TRIAL until you cancel your subscription. You may CANCEL ANYTIME without penalty within the first month. Cancellation after the first month will stop your subscription for the next month and you will no longer be charged.